MTM Physiotherapy Warwick, located within the recently refurbished Warwick Stadium, is conveniently placed to meet all of your Greenwood Physiotherapy needs. Since opening its doors in February 2016, the MTM Physiotherapy Warwick team have been providing services to those who call the surrounding suburbs of Warwick home, such as Greenwood, Kingsley, Madeley, Carine, Duncraig, Hammersley and Marangaroo. Situated just on the other side of Warwick Road from Greenwood we are well placed to help your local community. MTM Physiotherapy Warwick is involved in the local sporting community around Greenwood, proudly sponsoring the West Coast Warriors who call the West Coast Netball Region home, as well as the Greenwood Netball Club. Your experience at MTM Physiotherapy Warwick will include a comprehensive musculoskeletal assessment not only within our brand new treatment rooms but also the court and gym facilities of Warwick Stadium. This allows us to carry out a more detailed examination of your movement patterns and function related to your occupation or favourite sport. With access to the highly equipped Warwick Workout gym, the team at MTM Physiotherapy Warwick can develop individualised exercise rehabilitation programs to assist you to return to your full function following acute injury or surgery or to assist in managing chronic conditions. If you have any questions, please feel free to give us a call on 6244 0345. Our friendly Physios are always happy to have a chat. 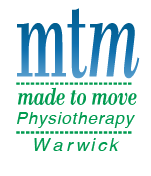 Come and see one of the Physiotherapists at MTM Physiotherapy Warwick today!